Let us tell you about Madina! As you may know, running a small business in the United States can be challenging. Now imagine running your business without access to clean water, especially a restaurant. This obstacle is something that Madina Fanette understands well. Her restaurant, which she recently opened in her front yard, is a favorite among the locals. However, her journey to get there has been nothing but difficult. Madina grew up in the second largest city in the country of Central African Republic, Berbérati, where she now owns Bébé Moukandjo. She’s always loved cooking and pursued her passion through two years of culinary training. In 2012, she was working at a nice restaurant in Bangui when her life was suddenly turned upside down by the Civil War. Over 20 percent of the population had to flee the country and Madina was part of that statistic. A restaurant patron and his wife helped her escape, but due to the uncertainty she was facing, she had to leave her baby behind with her mother. in Benin, which was over 1,500 miles from her family. She opened her first restaurant and put herself to work as the cook. This past summer, she was finally able to safely return back to the Central African Republic and was reunited with her child. 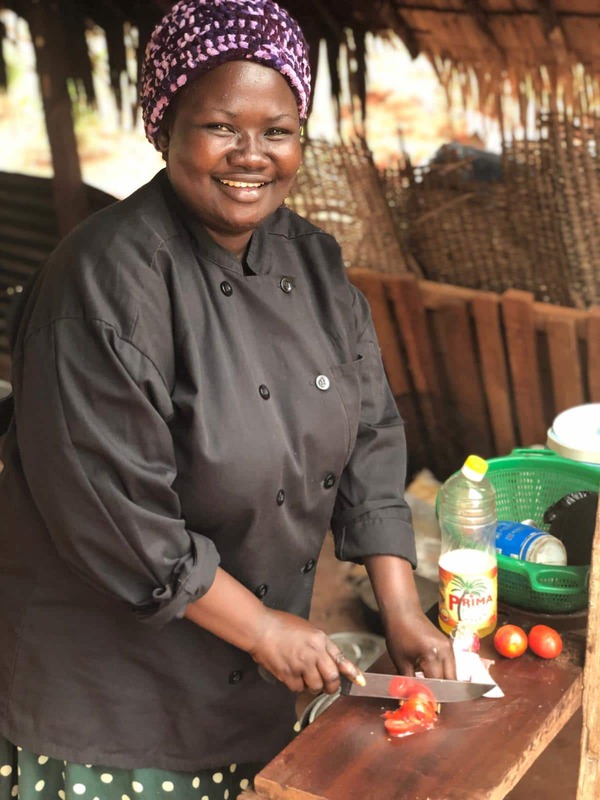 With her entrepreneurial spirit still intact, she recently opened a small restaurant. She has found a niche doing delivery meals and wedding cakes. Her place is also quite popular for the soup she serves on Saturdays. She has the best in town! 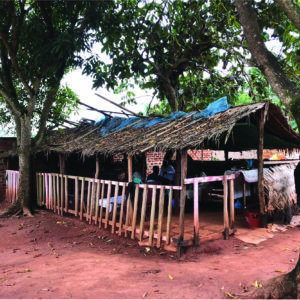 As you can imagine, owning a restaurant in a third-world country can be difficult. Since she doesn’t own a stove, she does all of her cooking over a charcoal fire. There also isn’t enough reliable electricity to run a freezer, so she cooks the meals for her clients daily. we are able to help others just like Madina. 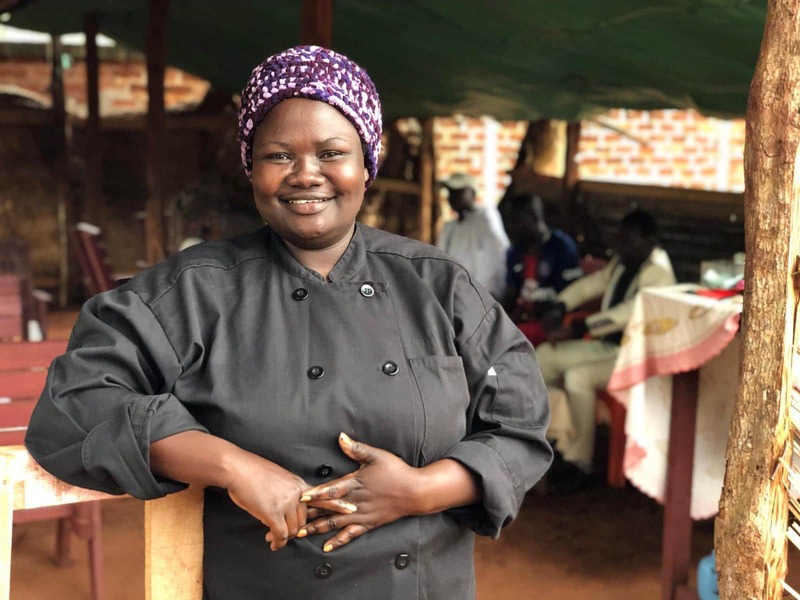 Thanks to the supporters of Water for Good, the one thing she can count on is reliable access clean water, making her food safe for others to consume and giving her restaurant the ability to thrive. We are able to show God’s love through meeting the very practical need of access to clean water. We’d love to partner with you to help touch lives physically and spiritually, through providing access to clean water.